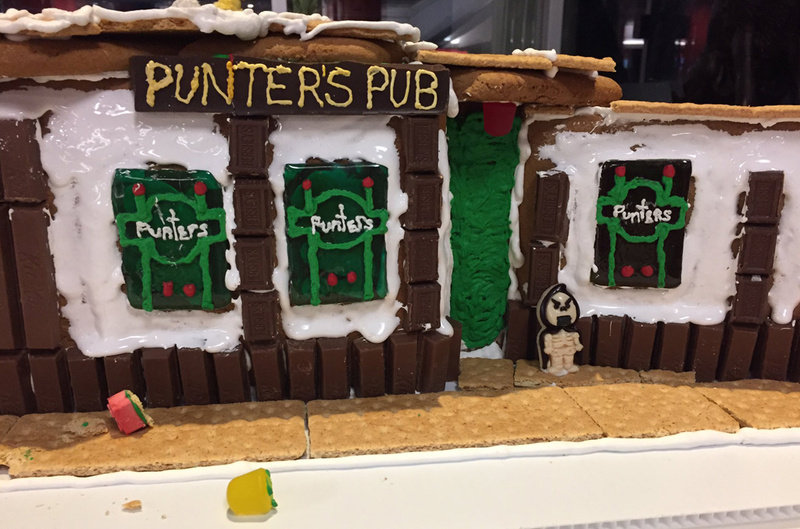 Lisa McColgan reports somebody at Northeastern made this gingerbread homage to the fabled and now closed Huntington Avenue watering hole. She adds the interior was "terrifyingly accurate:"
Last day was Tuesday, I believe. What happened to the fixtures? I haven't thought of that place in ages. I used to go there when I attended the now defunct Boston State College on Huntington Ave. in the 70s. The drinking age was 18 then. I thought Punter's would be there forever. I thought Boston State would be there forever. I thought the drinking age would be 18 forever. I thought I'd be young forever. Times change. Other great cake deserving bars , the Cask on Huntington , and the Dugout. a dungeon lite type of place! Also, the Drinking Fountain in JP (RIP) and the 12 Bens on Adams St in Dot. Facilities and Campus Planning. Northeastern had a gingerbread competition and the artists are from facilities and campus planning. Maybe it will reopen as a bakery. The smells aren’t terrifyingly accurate! Me and a gal from NU in the back of punters. Wooooweeee! I never went there, even though I was often in the area. That was a NU place and as a BU kid it seemed out of bounds. My loss. I lived in there Mon -Fri nonstop from 1978 to 1982. Too bad Northeastern was a 5 year school so I'm still short about 9 credits. Definitely gonna miss both Steve and Smitty!